Good nutrition or nanny state. Offering nutritious food and sound education on nutrition = good nutrition. Forcing kids to eat nutritious food = nanny state. It comes down to choice (good nutrition) or force-feeding (nanny state). Would you run that by me one more time. I understood everything but the Greek Part. It's all Greek to me. Now what is the difference between Nutrition and the Nanny State? There is that old story, you can lead a horse to water but you can't make him drink. AMERICANS are the fattest people on earth at 30% obesity rate-canada is at 14% and the asian countries at 4-5% as being FAT are also unhealthiest!!! As a college educated Diabetes Care Manager with extensive nutrition education, the school healthier lunch programs are excellent. Childhood obesity in US is growing rapidly, and so is dx of Diabetes in children. But still many children are not overweight. Medically the new lunch program guidelines are much healthier for our children. It's a new program and the parents must help the school to develop their program to it's fullest potential. Whether each school is utilizing foods that kids will eat, will be something that school and parents will have to work on. It's actually not that difficult, but unfortunately most employed to be in charge of the lunch programs are not well trained nutrition experts, and some may not be very creative thinking of what kids will eat.. But at least food is healthier. Some of the school lunch programs served foods in past were pretty nasty and unhealthy. And we must all realize school lunches will never be perfect, and must realize some kids are just too picky so parents have no choice except to fix lunch for these particular children. This has always existed, even way back when I went to school. Smile – and I have one grandchild like that. Love him dearly but he is very picky and extremely limited on what he will eat. And lots of wasted food has existed all along too. But with parents, PTA, and school working together the healthier lunch programs can succeed, and kids will like the food. Might take some parental and PTA push, but that does work. Going back to the unhealthy canned, nasty foods served in past is not good for the health of our children. I would hope all parents would be interested in their kids health, and especially giving them good healthy foods. Medical profession has have been pushing healthier eating for years. As a medical professional I strongly feel the healthier school lunch programs should stay in place. Each school program may need some revamping a little, but that can be done with help of the parents working closely with the schools. My daughters school gives the kids plenty of options and no one pays for lunch to reduce the stigma of free/reduced price lunch. That being said they still require the kids to take 3 items at a minimum. Plenty of days my kids wants just the entree and fruit. She has to pick something else to get her tray from the lunch line and where do you think it ends up? Maybe one of her friends gets it if they want it but mostly its trash. What good is a nectarine in the garbage? My kid loves all kinds of fruits but few vegetables. So why think that just because you and I both want her to eat carrots that she will? That is the crux of the matter: personal choice. I can't think of a good reason to make anyone go through the school day hungry because of what a government bureaucrat wants. I was so sorry to see what you have posted. But what you actually posted sort of indicates you are not really interested in good healthy eating for your children/child. This is not a bureaucratic program as you claim. These guidelines were set up and established by top US experts quite a few years ago. The school lunch program just utilized these recommended meal nutritional guidelines. The medical profession has been promoting healthier eating for years. But you are entitled to your own opinion. Work with your school – group of parents and PTA could sure help make the program successfu and getting them to serve more foods kids will like. You might be pleasantly surprised. You sound like a loving caring parent, and want what is always best for your child. But your child eating healthy foods is also big part of you being a good parent to your child too. Its Stiles, not Styles so maybe you missed more than that. I am as interested in healthy eating habits as the next person, and I eat accordingly. That being said, as a child I did not care for the tastes of many things, vegetables being chief among my dislikes. As I grew, my tastes changed and matured so that I do eat a great many things I could not stand as a child. It is my hope that my child will grow to like things as I did. That being said, I don't think the advice of government "experts" is the only advice to which anyone should adhere. I took my concerns about my child's limited dietary choices to her pediatrician. Her advice? Make sure she was getting a good multivitamin and as much good protein/fats into her as I could. Keep offering her healthy choices, encourage her to try new/different things but make sure she got caloric intake. Children need healthy fats, lean protein and enough calories for physical/mental development. Government experts have changed the food pyramid in my lifetime. These new "guidelines" come with a caveat: meet these standards or lose funding. I think there needs to be some guidelines [ketchup isnt a vegetable ;^)] but at the same time no child should leave the cafeteria hungry. Don't you agree? I do sincerely apologize for me misspelling your name. Was ig whoops. Sorry. H-mm does sound like your daughter may be very much like my one grandson. Quite picky eaters. 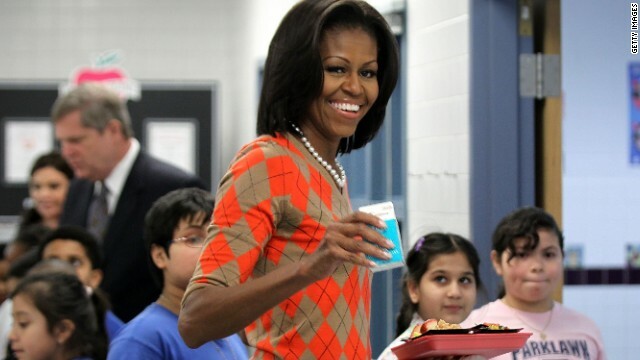 Your child eating a school lunch may just not be a good option for your child. It wouldn't be for my one grandson who is one of the worst I've seen in quite awhile. My son who is MD and his wife who has her MBA and who is daughter of cardiologist and mother who is RN who also has PHD in psychology are both strong advocates for healthy eating. At home they have always made their son take at least two bites of varying vegetables, etc. After many years it does seem to be working to a degree as he now loves at least two green vegetables. But we all agree he will always be a picky eater than most. And of course occasional junk food meals are fine. Same goes for deserts. Thank goodness their other son loves everything, and will try anything. I am not sure if school will be able to fix your child something special or not. Usually they won't, but doesn't hurt to ask. Fixing a bag lunch might be best. You don't want her/him to be hungry at school. That can affect ability to learn. School lunches programs are not for all children. That existed for some even when I attended school many years ago. Yes, the food pyramids have changed slightly over the years. Results of approved scientific studies have helped make this possible. And that is good to see these advancements. It will continue to change in future too. Etc, etc. Medicine works much the same way. Dear I don't need any luck with this as I can afford to do for my child. The kids who need the luck are the kids who have no other options. Kids who have no money to do anything but eat school lunch are being told eat this or go hungry. You tout the example of your grandson. It took years of trying to get him to like 2 vegetables. That is too long for a kid without options to go hungry in a program designed to combat hunger. Or am I wrong? You seem to think that throwing out the qualifications of yourself and your family somehow makes up for the fact that these kids without options have to leave the school cafeteria hungry and are throwing away food. I don't have a PhD or an MBA. I do have a firm grasp of nutrition and have had serious discussions with my child's pediatrician on the matter. If its a vitamin/mineral question we are worrying about then a multivitamin is the easiest solution to this situation. If its balancing protein/fats/carbs then that's a different story. Children are not adults. They need more protein and more fat to develop. If a kid needs protein and calcium why wouldn't you let them drink chocolate milk instead of worrying about the chocolate? If it makes kids want to drink their milk I say Great. Either way, forcing kids to take foods they wont eat so experts can tout the health benefits of the options smacks of hypocrisy. The old adage is first you get a degree and then you get an "Education". Have you ever studied soils and the requirements for plants to grow. There is about 18 basic soils elements required for a plant to grow. The same elements for all plants. Plants take up very basic elements, broken down in the soil before taken up by the plant. Then the different type of plant product is synthesised in the leaves to develop the final product. So, cattle may only eat grasses but become the beef we may consume. So, all the ingredients are available in many foods provided for young students. Forcing them to eat something they don't like is not necessary. As long as they eat something they will be OK. I wonder if you receive federal funding in any way? I eat lunch with my daughter at least once a week at her school and I will say this: We need to do something different if we want this better nutrition to work. They tell the kids they must take 3 items of there choosing and kids just end up throwing stuff away. My kid packs a bag lunch 4 out of 5 days because she doesn't like the options. Tray after tray of salad, fruit and veggies go right into the trash. I eat things I don't like as an adult because of the nutritional needs but I promise you there are still things I refuse to eat because I cant choke them down. Why expect you can make a kid eat whole wheat pasta when it tastes like crap? In the grand scheme of things, wouldn't you rather they ate regular pasta and got whatever nutrition and calories they could get instead of taking one bite of the whole wheat pasta and trashing the rest? The whole idea of the school lunch program was to keep kids from being hungry. You cant tell me that we cant make changes gradually and a little more appetizing then we are now. We probably can make it more appetizing. But I will point out that the food industry has put a lot of stuff in our food that makes foods more appetizing to our pallete that are not healthy. Part of the problem is that the GENERAL food supply (what you get at restraunts, supermarkets and at home) is filled with things that your taste buds like but are bad for your body. The reason that is a problem is that when we actually get served "good" food, we don't find it to be tasty because it lacks fats, sugars and other added "taste" ingredients that should never be there to begin with. I don't think that's a strong argument to add that crap back to school lunches. It's more of an argument to remove it from everything else. Taste is a funny thing. When I switched from regular peanut butter to natural (just from peanuts) peanut butter, I struggled. It didn't taste good at all to me. It wasn't SWEET. But it isn't supposed to be sweet... it's supposed to taste like peanuts. I had just been conditioned to WANT the sweet taste. And after a year I stopped missing it. The sweetness didn't add anything. It didn't make it healthier. It just made me crave it more. Why is that considered positive for foods... the added ingredients to create cravings? So we have to feed everyone some paleo/raw diet? Do we have to serve kids cucumbers instead of pickles because of the salt content? Its still the same vegetable. Do kids have to eat raw broccoli with low fat ranch dressing instead of steamed with cheese? Personally I'd rather give kids something they will eat with a modicum of nutrition vs something they wont eat that will meet a standard for "healthy" set by bureaucrats. People crave flavor because they enjoy it. Food should taste good. I have learned to eat quinoa and spinach but it took 45 years to do it. Let the kids who need it the most get something to satisfy their hunger with some balance between healthy and tasty. Cause brother whole wheat pasta mac and cheese tastes awful. Get the sugar out of our food. No one-lunch fits all, just do it. I believe its not working my main reason we parents are asked to supply snacks for the kids. Reason is a lot of the students don't get enough at lunch time. When I was in school my parents never had to supply snacks because we had a full lunch. If you want to help with the nutrition of our kids take out pop and snack machines. Please implement some sort of debate-like rules to ensure that viewers can here one comment at a time.